33 x 86 cm when inflated with either helium or air. Our Supershape rose gold number 1 balloon is a statement piece at a milestone birthday or anniversary party. This is a very popular option for a 1st birthday celebration and look amazing in the background during a cake smash photoshoot. These giant balloons are supplied flat (uninflated). They can be filled with either air or helium and be hung from tabs at the top of the balloon or else attached at the bottom to ribbon and a balloon weight (when inflated with helium). 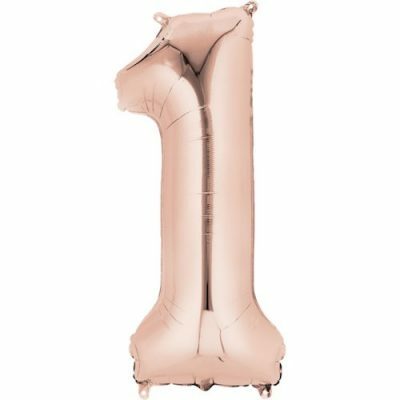 These professional quality Supershape balloons are slimmer in design than many other jumbo foil number balloons and use up to 30% less helium to inflate – this is a great option if you have a lot of balloons to inflate. Take care to not overinflated the balloon with helium.